"After working in the shadows, the team at Treyarch returns this year with Call of Duty: Black Ops III. There’s so much to talk about and I’m sure you all have plenty of questions, but the good news is you won’t have to wait long for answers—the world reveal of Call of Duty: Black Ops III is set for Sunday, April 26." "Call of Duty®: Black Ops 3 is the first title for next-gen hardware in the critically acclaimed Black Ops series. Developed by Treyarch, the award-winning creator of the two most-played games in Call of Duty® history. Call of Duty: Black Ops 3 deploys players into a dark, twisted future where a new breed of Black Ops soldiers emerges and the lines are blurred between our own humanity and the technology we created to stay ahead, in a world where cutting-edge military robotics define warfare. With three unique game modes: Campaign, Multiplayer, and Zombies, providing fans with the deepest and most ambitious Call of Duty ever." So it looks like you are getting Zombies and war in a "dark, twisted" future with robotic enhancements. Sound good? 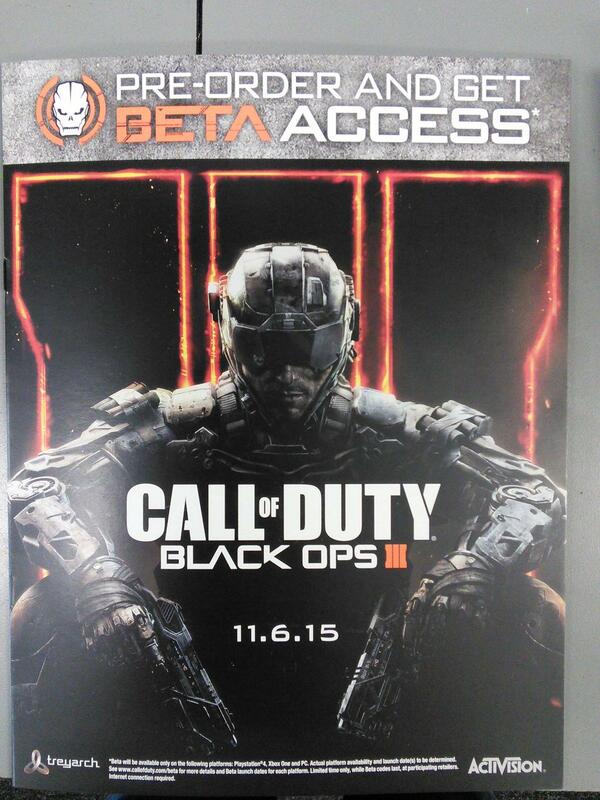 A retail poster has emerged revealing that Call of Duty: Black Ops 3 will be available on Friday, November 6th, 2015. It confirms that preordering the game will grant access to the Black Ops 3 beta. A start and end date for the beta has not been confirmed, but once the information goes live more information will be available on callofduty.com/beta. Furthermore, the poster mentions PlayStation 4, Xbox One and PC only, indicating that the franchise is finally leaving old-gen consoles behind.